The family business that grew to become Peugeot, was founded in 1810 for the manufacture of cofee mills, The company’s entry into the vehicle market was by means of crinoline dresses, which used steel rods, leading to umbrella frames, saw blades, wire wheels, and ultimately bicycles.[. The comopanies Lion mascot trademark was first applied in 1858. Their first automobile, an ubreliable steam car was built by Armand Peugeot and Leon Serpollet in 1889 and followed in 1890 by an internal combustion engined car with a Panhard-Daimler engine. Armand formed Société des Automobiles Peugeot. in 1896.. More cars followed, 29 being built in 1892, 40 in 1894, 72 in 1895, 156 in 1898, and 300 in 1899. Peugeot was an early pioneer in motor racing, with Albert Lemaître winning the world’s first motor race, the 1894 Paris–Rouen race, in a 3 hp Peugeot. Peugeot built their own engines from 1896. At the 1901 Paris Salon, Peugeot debuted a tiny shaft-driven 652 cc (40 cu in) 5 hp (3.7 kW) one-cylinder, dubbed Bébé (Baby), By 1903, Peugeot produced half of the cars built in France, and they offered the 5 hp (4 kW) Bébé, a 6.5 hp (4.8 kW) four-seater, and an 8 hp (6.0 kW) and 12 hp (8.9 kW) resembling contemporary Mercedes models, and had started to build motorcycles. Ettore Bugatti, designed the new 850 cc (52 cu in) four-cylinder Bébé of 1912. and in the same year returned to racing,, winning the 1912 and 1913 French Grand Prix’s and becoming the first non American manufacturer to win the Indianapolis 500 in 1913. 1914 was a baron year for the racing team, but Peugeot returned to the USA to win the 1915 Vanderbilt Cup and on home soil the French Grand Prix. Post WW1 production resumed in 1919 and flourished, along with the companies racing results. 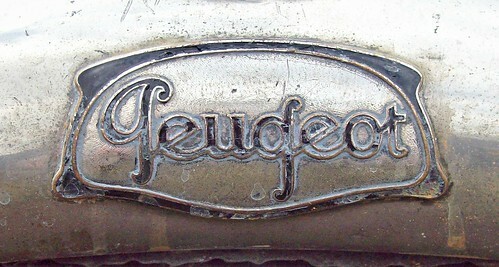 During the 1920s, Peugeot expanded, in 1926 splitting the cycle (pedal and motor) business off to form Cycles Peugeot, while the auto division aquired Bellanger and De Dion in 1927. New for 1929 was the Peugeot 201, the cheapest car on the French market, Soon afterwards, the Depression hit; Peugeot sales decreased, but the company survived. The companies fortunes were revived in the 1930’s with the introduction of a new model range, the 202,302 and 402 establishing the Peugeot practice of a three digit model name with a zero at its centre. Production was interupted during the second World War period, restarting in mid 1946 with the 202, the 203 was launched in 1947 setting new sales records and remaining in production until 1960. Like many European manufacturers, collaboration with other firms increased; Peugeot worked with Renault from 1966 and Volvo from 1972. In 1974, Peugeot bought a 30% share of Citroën, and took it over completely in 1975. he joint parent company became the PSA (Peugeot Société Anonyme) group, which aimed to keep separate identities for both the Peugeot and Citroën brands, while sharing engineering and technical resources. Peugeot thus briefly controlled the racing name Maserati, but disposed of it in May 1975. In 1986, the company dropped the Talbot brand for passenger cars when it ceased production of the Simca-based Horizon/Alpine/Solara models. What was to be called the Talbot Arizona became the 309, with the former Rootes plant in Ryton and Simca plant in Poissy being turned over for Peugeot assembly. Producing Peugeots in Ryton was significant, as it signalled the first time Peugeots would be built in Britain. The 309 was the first Peugeot-badged hatchback of its size, and sold well across Europe. The larger 405 was voted European Car of the Year for 1987. This, too, was a very popular car across Europe, and continued to be available in Africa and Asia after it was replaced by the 406 nearly a decade later. By 2010, Peugeot planned on pursuing new markets, mainly in China, Russia, and South America, and in 2011 decided to re-enter the Indian market after 14 years with a new factory at Sanand, Gujarat and entered the Phillipine market in 2012. In October 2013, Peugeot closed their production plant at Aulnay-sous-Bois as part of a restructuring plan to reduce overcapacity in the face of a shrinking domestic market. By December 2013, Chinese investors were rumoured to be potential investors. In February 2014, the Peugeot family agreed to give up control of the company by reducing its holdings from 25% to 14%. As part of this agreement, Dongfeng Motors and the French government were each to buy 14% stakes in the company, creating three partners with equal voting rights.